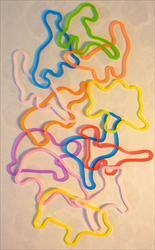 Packs of 12 memory shape rubber bands; also known as Silly Bands. These fun shapes are a hit with boys, girls, and adults of all ages. Colors and exact shapes may vary from pack to pack, which is part of the fun!